The advertiser provides additional information about the company and its products in a standard form. 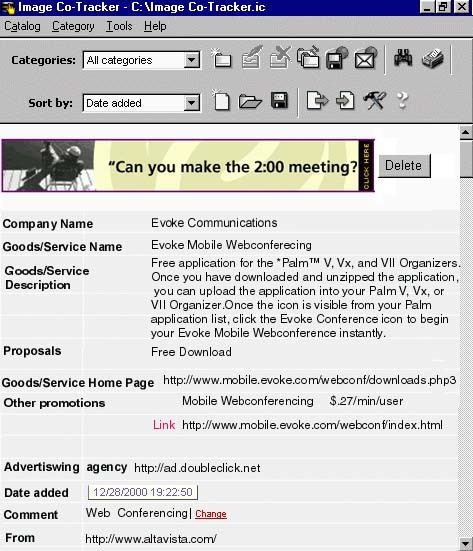 The additional information allows the advertiser to include more than one proposal in a single banner, and this information would all be available in the end user�s Co-Tracker database. The standardized information associated with banners will make end-user database searches more effective (for both the user and the advertiser). Conceivably, users will visit the advertiser�s site more often. The only additional work for an advertising company to support BannerML would be to provide additional information for each banner in the standard BannerML format. Click here to see a sample of this type of information.